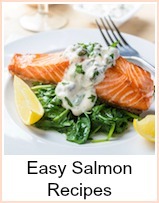 This gourmet salmon recipe is provided by my good friend Bill from Smoker Cooking and I think you will thoroughly enjoy it. It can be cooked in a smoker, on the grill, or in your kitchen oven. 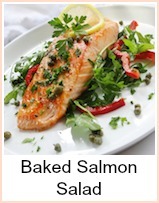 Salmon is a versatile food that can be prepared in a variety of ways. 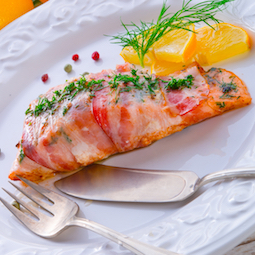 Whether grilled, smoked or baked, salmon is a true gourmet treat. This recipe combines fresh salmon with Proscuitto...an unusual combination that I'm sure you'll like. Proscuitto is a flavorful Italian style ham that is salt cured, then air dried for several months. The intensely flavored ham is usually cut into very thin slices that can be eaten as-is or used in recipes with other ingredients. This recipe pairs salmon with Proscuitto, and can be served as an entree', or chilled, sliced, and served as an appetizer. Cut the salmon fillet into one inch wide strips. Slice a couple of the green onions into thin, matchstick size strands. Use both the green and white parts of the onions. Lightly season the pieces of salmon with salt and pepper. Place strands of onion on top of the salmon, then wrap each with a slice of Proscuitto. Secure the Proscuitto in place with toothpicks. 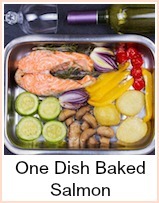 Place the salmon in a shallow pan, and bake in a preheated 350 degree Fahrenheit oven for ten to fifteen minutes, or until the fish just starts to flake when tested with a fork. Optionally, these can be charcoal or gas grilled, but be sure not to place them directly over the coals or the gas flame. Use indirect heat and a covered grill. They can also be smoked in a food smoker, but be sure to use a very small amount of a light flavored wood, such as alder, so the flavor of this gourmet salmon recipe is enhanced but not overpowered. This Proscuitto Wrapped Salmon recipe combines fresh salmon with Proscuitto...an unusual combination that I'm sure you'll like.